May 2016 edited May 2016 in Wishlist! @DarleneI - for what? LOL the minute you give up on your dreams and wishes, well need I say more?? I believe you might be wishing for a plugin for your Vue. There are a bunch more of us waiting for a plugin for the Force. Yes, keep adding to the wish list. @Crazy_Mr_Zing - not such a crazy thought! I wish then I create. What about the absence of comments from the creator(s) of MTC about any new release or new update on MTC or any intention to update the software at all. I understand that the updates are free forever and that no more money would come in their pocket but we all agreed (for what I am reading in the forum) to pay more to get a ''plus'' version of MTC. SCAL had been updated more than 5 times in the last year only and is still updated on a regular basis. 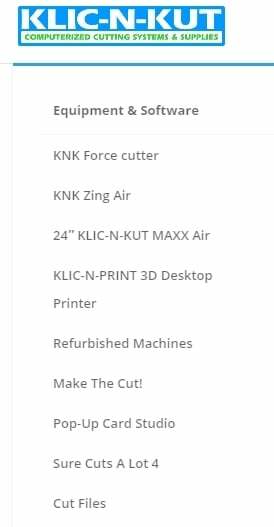 Also, why KNK Usa on their web page, promotes MTC and don't even mention that SCAL is working from the box with the cutter (still need some update to use the full features, but is pretty good). Andy mentioned in a webinar about a month or two ago that he is working on an update. @dedethom - when was the last time you visited the KNKUSA products page? It has been there for a long while. Also, a long time ago, Bryan forbid Andy from making promises about when, if at all, a new update would be delivered. Bryan has also stated that MTC is not a dead in the water product. He may be working on an update now. We have never gone without Webinars in the past. It's been two months now - they may be avoiding going over old stuff when something new is right around the corner. I just love it when Andy comes out with a new update and they have So may new things to teach us. SCAL does come with new versions but you still have to pretty much learn on your own. MY cutter does not work with MTC but I can't do much with SCAL or ECAL. I work in MTC, save as .svg, import to ECAL so tat o can cut. That company does not have the support system tat we have. When a new version comes out, that forum get very active again. It's all good. @Bobkat - I believe that Bryan explained that the webinar service (Go To Webinar) was too expensive to continue to pay for and they were going to look for an alternate platform to use that was less on a monthly contract or even free. @tuicarlos - I have been here since the very, very beginning of MTC. I am also a very big supporter and believer in MTC, but never, ever have I expected to have an update or upgrade or new version, especially for free. Love to have one, and have often said, give us a Pro version that costs lots, but if its not coming, my moaning about it isn't going to make an iota of difference. Is there any point arguing back and forth on whether the software should be updated infinitum. if you feel strongly that there a bug that really needs attending to really the only person the can give a response to if and when it would be attended to is the developer. @Crazy_Mr_Zing - you are right, there is no point to any of the arguments, until we hear something from the developer. It's a moot point. Let's not forget, Andy is the father of young children and I'm sure they require some/most of the time he formerly used to work on MTC. I'd love to see an update/upgrade as well but will continue to work with what I have for now. Well dreaming up, upgrades is easy - getting a creator of the software to play is another. There's gold in them there hills so if Andy wants to make a killing he needs to create a plug in for the Force. He might then find he is in the mood to do some of the upgrades on the wish list. On the other hand he might be like me and be overwhelmed by all the options people want. It's one thing to do something one enjoys and another one to feel pressured. If the idea appeals to him he will do it but until then I think we have to accept the software as it is - I will continue to use MTC because it suits me and also it's trace facility hasn't got a rival so even if I was to get alternate software I would still use this particular facility. Thank you Andy for a good program, I will wait and see what happens. I still think MTC is great software! I have expanded into sewing and just used the pixel trace feature on my scanned copy of the applique pattern in a kit I recently purchased. I wanted to enlarge and split up the different pieces so I could print them out on separate sheets of Heat and Bond. now I'm off to cut with my zing! This post saddens me greatly to write. I am ready, however, to voice my opinion. I am a longtime and enthusiastic supporter of MTC. That hasn't changed. I love MTC and I am very fond of Andy and Ann. I am, however, deeply disappointed in the seeming abandonment of the software, and now, the webinars. Though I never watched them live, due to scheduling issues I did watch the recordings. No longer having them speaks to a lack of platform health in my book. @Andy and Ann are barely visible. This impacts the community feel of things and diminishes what set MTC apart from other options. They were always so invested in us and us in them. There have been bugs in the Zing software for years. This was a professional contract. If I were KNK, I'd feel betrayed. Not even remotely pretending to speak for them. Yes, there are workarounds, but who wants to live with those forever? I am ready to invest in SCAL for the Force. This breaks my heart! It feels like a betrayal of Andy, but in the absence of a solid commitment (not the "I didn't say which year" quip), I feel I must fend for myself. Given the alternative between free software for life and more expedient upgrades, I'd far prefer to pay. I have, in fact, donated to Andy voluntarily for some of the updates in the past. As the parent of 5 kids, I fully appreciate what having three young kiddos can do to one's life. I'm all about setting reasonable expectations. I'm not so forgiving of silence and endlessly soft deadlines. I would welcome a solid commitment and will hold off for a few more weeks before purchasing SCAL, but I won't put it off forever. It such a commitment isn't possible, MTC, Andy and Ann will still have my support. But my loyalties will be divides, sad to say. You should carefully read the following terms and conditions before using this software. Unless you have a different license agreement signed by Make The Cut, LLC. your use of this software indicates your acceptance of this license agreement and warranty. You are entitled to unlimited, free use of the unregistered version of Make The Cut! (the Software). For registered release you have to pay a license fee, by following instructions prompted by the Software. Should the Software prove defective, you and not MAKE THE CUT, LLC. assume the entire cost of any service and repair. MAKE THE CUT, LLC. IS NOT RESPONSIBLE FOR ANY INDIRECT, SPECIAL, INCIDENTAL, OR CONSEQUENTIAL DAMAGES OF ANY CHARACTER INCLUDING, WITHOUT LIMITATION, DAMAGES FOR LOSS OF GOODWILL, WORK STOPPAGE, COMPUTER FAILURE OR MALFUNCTION, OR ANY AND ALL OTHER COMMERCIAL DAMAGES OR LOSSES. Title, ownership rights and intellectual property rights in and to the Software shall remain in MAKE THE CUT, LLC. The Software is protected by international copyright treaties. Unauthorized reproduction or distribution of this program, or any portion of it, may result in severe civil and criminal penalties, and will be prosecuted under the maximum extent possible under law. Not wanting arguing here. I still use MTC every day. It's tracing feature is the best. I have several other programs that I paid for to see if they compare to MTC. They do not! I'd rather put my money on MTC. I feel like I have more than received my money's worth! Will shell out more especially if it would cut to my Invue too. I think you will find some of the wish list item have been fulfilled. Some are asking for things that already exist they just don't know how to use the feature. Are you suggesting proposing that Andy obligated continue to upgrade the software to add more and more features? I still like and use MTC and will continue to do so. I have however also invested in other software including Corel, CraftnCut and the Business Edition of the Silhouette software to allow me to do the things I need to do with my designs. I'm probably going to invest in SCAL as well before too long (I enjoy learning software). I would certainly like to see some updates/upgrades and am disappointed that there is no feedback. I would willingly pay for an upgrade to MTC. I used to recommend MTC to others looking for software alternatives to the Sil software but don't anymore. This is not because I don't like and use it but mainly because of the fact that there have been no recent updates or upgrades and no feedback as to whether there will ever be one. This thread has not felt like an argument to me. It's a discussion and a good one, in my opinion. Mtc isn't 'just' a standalone program anymore, it was also picked to be the operating software for some knk machines. That comes with more obligations and responsibilities than something you made and don't want to bother with, anymore. Frankly, I'm surprised that knk hasn't decided to drop mtc in favor of scal, who updates often and includes knk cutters without being asked. The fact that it was made to work with the force before it was even officially released, and mtc wasn't, says a lot in my book. Why would I continue wishing when it appears no one is showing any sign they are interested in listening ? SO where would the new sales come from ? Pazzles Unlikely to be many until there a plugin even then ? I don't usually comment on things but I am going to today. I have an old software program for designing homes, paid $59 or so 12 years ago. So I was looking for an update of some sort and I found a new software, could download a trial version. I did and it has SO many things new things I can do. Cost for this software over $1000. I'll stick with my old one. I use PhotoShop Elements and every year a new version comes out with all the bells and whistles, cost is a minimum of $49 if you can get them at Costco before that special is gone. Usually they are 79 to 99 dollars. Recently the PS Elements magazine (a digital version) has shut down --they are losing money. With my cricuit, I had SCAL years ago, got MTC and have loved it for years. I got a new Zing machine and MTC software came with it. I still love it. I know for what I paid for it I've gotten my moneys worth. The forum has been a big part of MTC. Not many other software products provide as much technical support and help. I think it is hard after having good support to not have any questions being answered about the direction of the software. All of us who bought this MTC software that learned how to use it have gotten our money's worth. This program has entertained me for hours on end. Like others have said many things on this wishlist have been implemented. This program is not how Andy makes a living. It started out as sort of a hobby. Another thing I think we may need to consider is scrapbooking is not as lucrative as it was for a while. The metal dies have taken over machines for a lot of people. Even I have several of the really intricate ones and I absolutely love the stitched dies that came out. Our cutters can't get the crisp look some of the dies get. I'm sixty three yrs old. I lost one of my best friends recently and she loved scrapbooking. Her other fiends and daughter don't do scrapbooking. Every hobby has it's day and then fades away. I love my MTC and like other have said I got my money's worth. I love it so much I would be more than willing to pay for a pro version. I have craft artist 2, scal, PSE 14, but MTC is my go to software. I have the pazzles vue and the silhouette portrait and still prefer MTC to their software. My biggest wish is a group function, I would pay for that alone:). I guess my idea of a group function is different as I'm thinking would moving the said items to a separate layer be similar once there they can be all selected as one and acted upon as a group ?